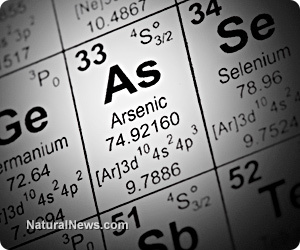 (NaturalNews) The dangers associated with the heavy metal arsenic extend far beyond just its direct effects on immunity and cognitive function. A recent study published in the journal Environmental Health Perspectives (EHP) reveals that chronic exposure to this deadly poison actually prevents the body from naturally removing many other toxic heavy metals like lead, mercury, iron and cadmium, allowing them to gradually accumulate in tissues and the brain. Both in vitro and animal tests conducted by a team of researchers from Columbia University unveiled the fact that arsenic depletes the body's reserves of glutathione, the so-called "master antioxidant" that regulates a host of cellular events including gene expression, cell replication and the synthesis of both protein and DNA. Glutathione also helps protect the body against oxidative stress, which damages genes and could cause cancer. Besides inducing the type of oxidative stress that leads to long-term, chronic illness, arsenic-induced glutathione deficiency literally prevents the body from detoxifying itself. Practically every cell in the body relies on glutathione to maintain itself in a healthy state and prevent the spread of damaging free radicals. The kidneys and liver, which are the body's primary detoxification organs, also rely on glutathione to function normally. "Cellular detoxification is broken into three phases, and glutathione enhances these stages of detoxification in many ways," explains a report on glutathione and detoxification published by Maximized Living. "Toxins are detected within the cell, and modified through oxidation and reduction reactions into forms the body can target." "Once a toxin is detected and modified, its activated metabolites are then bound to or 'conjugated' directly to glutathione. There are other charged species in the body which may conjugate toxins, but glutathione is the primary contributor to this process. ... The conjugation of glutathione disables the toxic metabolites from diffusing across membranes, so that they are removed from the body." In other words, without glutathione, the body has no way to effectively deactivate, capture and eliminate toxins, which of course is a recipe for disease and death. This is why it is critical not only to minimize your exposure to arsenic but also to actively seek ways to remove it from your body so that glutathione levels can be more optimally maintained. This is especially important as the EHP study also found that chronic arsenic poisoning can potentially lead to an irreversible loss of glutathione in areas of the body where it is most needed. Evidence suggesting this included observations of what appeared to be an irreversible loss of both glutathione and various other nonprotein sulfhydryls in bile from the liver and urine. "These findings, and the lack of association between [arsenic] exposure and blood [glutathione disulfide] or plasma [cysteine], suggest that [arsenic] may exert its greatest influence on [glutathione] through binding and irreversible loss in bile and/or possibly in urine," wrote the authors of the study in their conclusion. "It is not possible to completely avoid exposure to toxic metals," explains the group. "It is, however, possible to reduce metal toxicity risk through lifestyle choices that diminish the probability of harmful heavy metal uptake, such as dietary measures that may promote the safe metabolism or excretion of ingested heavy metals."